In DirectX12 you are forced to manage the GPU(s) more directly so you can have the ultimate in performance. This means the API will not insulate you from silly mistakes. This means novices (like myself need to be vary wary of DirectX12. However, Despite DirectX12's added complexity, there is always going to be some newbie that likes banging her/his head against the wall... Becuase DirectX12 is more complicated, a different approach is needed to "easily" redraw the cube from the demo in more than one place. The easiest approach I found was instancing. Unfortunately, D3D12 Instancing is apparently even harder than D3D11 Instancing. The good news though is that once you've done it, your code should be more efficient. At the time of this post, there didn't seem to be very many introductary examples on DirectX12 instancing so I will try to explain how I *think* I was able to get it to work in this blog post. After that, you will be shown a "New Universal Windows Platform Project" Window from which you are supposed to pick your target and minimum versions for your UWP app. I'm not really sure what the implications are of choosing the different options but for this example, we can simply choose "Windows 10, version 1803 (10.0; Build 17134) for Target version and Minimum version. This tutorial is simple enough that other versions will probably work as well, but it would be best to err on the side of more recent versions if you had to chose a different value. 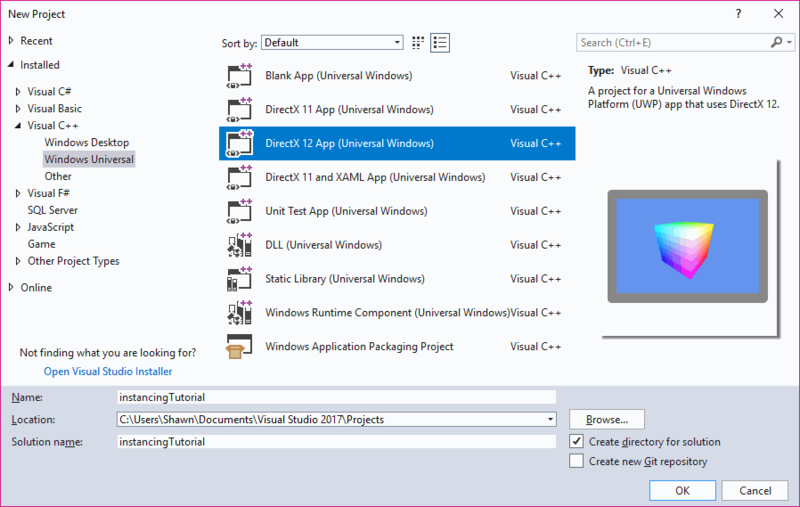 After chosing your target and minimum versions, VS2017 will create a project for you. If you build it, you will see a simple rotating cube. When you get a chance, you need to stop the project and expand the Content folder to look at the Sample3DSceneRenderer.cpp file that Microsoft created for you. // Direct3D resources for cube geometry. Pay particular attention to the fourth parameter for the structures in the inputLayout array. For the Vertex Buffer it is always 0 but for the Instance buffer it is always 1. Braynzar Soft explains in its D3D11 instancing tutorial that these are "slots" that in which the data will be loaded into the GPU for later retreival. The Vertex Buffer and Instance Buffer need to both be in different slots. Also, Braynzar Soft explains that the "POSITION", "COLOR", "INSTANCEPOS", and "INSTANCECOLOR" identifiers are "keys" that are later used by the Vertex Shader to retrieve the data. I'm thinking each of these keys need to be unique. // the pattern of a simple cross or letter "t"
// Create the vertex buffer resource in the GPU's default heap and copy vertex data into it using the upload heap. // The upload resource must not be released until after the GPU has finished using it. // Upload the vertex buffer to the GPU. // Create the instance buffer resource in the GPU's default heap and copy vertex data into it using the upload heap. // Create vertex/index buffer views. Notice above that when specifying the StrideInBytes size, we were about to use sizeof(VertexPositionColor). This is because we decided to keep using the VertexPositionColor structure that the Vertex Buffer was using and simply ignore the color data. We could have created our *own* data structure that *just* kept the VertexData, but that might have been even more hassle. Now, all of that mess and we are ready to actually use this data. We have to use it in the Vertex Shader which will be running inside the GPU. You need to open the SampleVertexShader.hlsl file under Content that Microsoft created for you. Two changes will need to be made here. One to the VertexShaderInput and and the other to the "main" function. The VertexShaderInput must match the D3D12_INPUT_ELEMENT_DESC inputLayout array we defined earlier so we need to add a few things. In the highlighted portion above, the indentifiers to to the right of the colon "INSTANCEPOS" and "INSTANCECOLOR" need to correspond to the identifiers we used when we created the D3D12_INPUT_ELEMENT_DESC inputLayout array. // Transform the vertex position into projected space. // Pass the color through without modification. // Set the graphics root signature and descriptor heaps to be used by this frame. // Indicate that the render target will now be used to present when the command list is done executing. In the above section of the Render function, you will need to call IASetVertexBuffer on your &m_instanceBufferView. 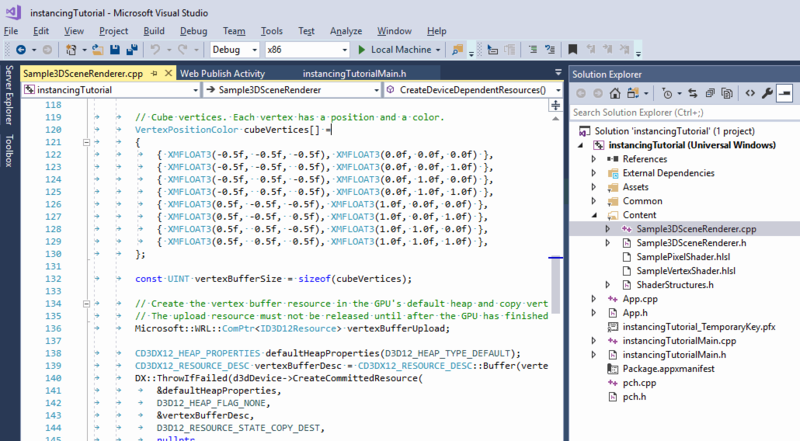 The code is highlighted, but notice how the first parameter is 1 instead of 0 like it is when &m_vertexBufferView is set. That is because the instance buffer is in slot 1 while the vertex buffer is in slot 0. Also, look at the section where DrawIndexedInstanced is called. The second parameter has been changed from 1 to 6. That is because instead of drawing one single instance we are now drawing six instances per call. This only works because we are passing six different VertexShaderInput values via the Instance Buffer. Without the instance buffer we wouldn't have an easy by to determine where to draw each of the six instances. There are other ways to figure out where to get the instancing data from, but I will not get too deeply into them. For example on Page 561 of Luna's  (and possibly other references), you will see that SV_InstanceID is a special vertex shader "command" that will allow you to retrieve the instance number that is being worked on from within the Vertex Shader. You can then use the instance number to either calculate the positions of the instnaces or lookup into "global" data. I think Luna is actually using the instanceID to look into a global instance data structure called gInstanceData but it isn't clear to me how the GPU gets visibility to that. It's also not clear to me how Luna's examples in his book tie into the Universal Windows Platform (UWP) that this particular example is based off of. For that reason, I chose to not use take Luna's approach and only use his text as a reference when I'm seriously stuck and Bing can't help me anymore [which is quite often by the way]. // Eye is at (0,0.7,1.5), looking at point (0,-0.1,0) with the up-vector along the y-axis. In the above code, change the z coordinate of your eye from 1.5f to 8.0f, and then run the program. If I told you everything correctly and you were able to follow me, you should see six cubes in a cross or t pattern rotating around just like the basic cube does in the Microsoft Supplied demo. The cool part is that you can probably figure out now how to modify your code to put the cubes wherever you want on the screen or to even add more 😀. Also, since you are using instancing, you can supposely render thousands of these such cubes on the screen with a single draw call without sacrificing any performance. If you look at the cited references, you will also learn that you can even apply textures and/or colors to these instances to make them unique, but I don't know how to do that right now and you will have to figure that one out for yourself. The end result will generally look something like the below animated GIF. Dulles: David Pallai - Mercury Learning and Information, 2016. This post is copyright (where allowable) by Shawn Eary and is released under the Free Christian Media Licence (FCML). Content from authors other than Shawn Eary maintain the copyright and license rules that were imposed by the original authors.